1. Provide service by following the example of Jesus to serve others the best way I can. 2.Create products that inspire one person/one community at a time. To do my personal creative best with each item, and always continue to seek improvement. 3.Present myself in a way that encourages dialogue that’s open and candid. To help make views of Autism change in others for the better. 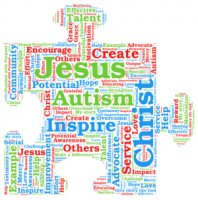 Help others with Autism to advocate, increase social abilities, and gain self-esteem. 5.To inspire others to reach their full potential and use their talents to make a difference. AND to bring God the glory through my testimony by impacting the lives of my customers and my community. 6.Share the gifts Christ has given me. PERSONAL REMINDER: Know that God is in control of the results of each venue. Recognize that God provides each person that helps contribute to the success and growth of this business.